will be Sharing the Joy of the Holidays and will remain open until 9 pm. Visit and experience your festive downtown community. 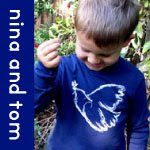 Today only, nina and tom are offering 20% off everything in the store and on line (+free shipping). Come by and say, "Hello and Happy Holidays!" and get some yummy cookies and fudge. I was just wondering how the new Consumer Product Safety Improvement Act was going to affect Nina and Tom? I know some of my other favorite mom and dad businesses are going to have to shut down, so I'm worried! "Everything Is Amazing and Nobody's Happy"